If you have ever wondered how to draw insects, here are some examples that show you the easy way of doing it. The insect drawings included here are of ants, a cockroach, the mosquito, the ladybug and a grasshopper. It helps if you copy from large pictures of insects to see them properly and observe how they really appear and not how we think they look. You can enlarge pictures by scanning them and then use your image program to increase the size. The quality might be blurry but you will see how to draw insects with more details. When you're learning how to draw insects, copy heaps of outlines first and don't worry about fiddling with adding effects until later. You will know when you are ready to start shading and putting in effective lines. Try copying this simple ladybird outline. My favorite pencil is a mechanical pencil because I am able to achieve really fine lines without much effort. I'm going off track here, but do you remember the ladybird song? My sister and I used to sing it whenever we found a ladybird. ''Ladybird, ladybird, fly away home. I have no clue where that came from! We always chanted it and I'm not even sure if it's right. That was our version anyway. The following information may help you achieve better results because it's good to have background information on your subject so you know what to look for when you are sketching. I like to throw in extra info that I think you might find interesting. An insect is a small, six legged animal. So, that would include little beings such as ladybugs, ants, cockroaches, bees, wasps, moths, grasshoppers, and mosquitoes, to name just a few. The list is very extensive, there's more than a million of them! The ocean is the only place where you won't find many insects. Many insects smell with their antennae and some taste with their feet. An insect breathes through holes in their sides, they don't have lungs. There are 3 parts to the body of an insect. Most insects have wings and antennae. Besides birds and bats, insects are the only other animals that have wings. Flies and mosquitoes have 2 wings, all other winged insects have 4 wings. Most insects tend to blend with their background. A perfect example of this would be beetles - they are black or brown predominantly. You'll find some insects resemble leaves or sticks. Insects don't need a lot of food and a single crumb would be considered a huge meal. Insects have a short life - they don't take long to become adults and lay many eggs. Insects help form the balance of nature. They feed on plants and animals but that's also reversed and they provide food for plants and animals. It's interesting that the skeleton of an insect is on the outside of its body. The best way to know how to draw insects is to try to remember some of these facts and you're off to a good start. 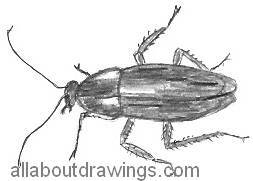 My Mum was repelled by my cockroach drawing so I figure I must have achieved a good likeness! I can see now that I could have used a darker pencil like a 5B or higher because my shading is too light to correctly portray this insect. I don't think too many of us like cockroaches, erk, but he was fun to draw! We all have different styles when it comes to drawing. It's not for me to try and tell you how to draw. I can only tell you how I reach the end result in my drawings. If it suits you to do the same, then that's great news. I get lonely sometimes and it's nice to know you are there with me. So, I am the type of person who likes to look, then draw. I study the individual lines without actually looking at the subject as a whole. I decide if it looks simple enough and if I think I'll be able to draw something to get a reasonable likeness. Of course, I'll have a go at anything first time around! Did I know how to draw insects properly? Definitely not, but I didn't tarry, I simply dived straight in and started drawing. I knew that was the only way I'd get a straight answer. I'm quite happy with these insect drawings. I thought the grasshopper had the highest degree of difficulty. I don't really know why, it doesn't look hard to draw, does it? However, I made a note on the reverse of the drawing that it took the most amount of time because I kept erasing until I was satisfied with the image. These notes are good for future reference. I mainly use photocopy paper because it handles lots of erasing without ruining the surface. It's perfect for a beginner and the A4 (letter) size allows me to do numerous illustrations on the one page. 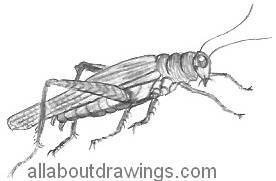 The grasshopper was the final sketch that I completed for my insect project. You won't know how to draw insects unless you have a go!